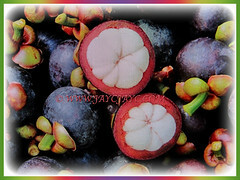 Mangosteen is a tropical fruit about the size of a tangerine and often referred to as the ‘Queen of Tropical Fruit’. 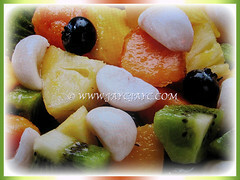 Its fruit is highly valued for its luscious, juicy, delicate texture and slightly sweet and sour flavour. 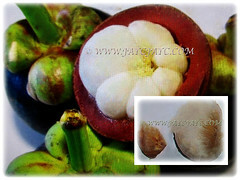 Common Names: Mangosteen, Purple Mangosteen, Manggis in Malay. Origin: Native to Malaysia and Indonesia. Plant type: An evergreen, perennial and tropical fruit-bearing tree. Features: Garcinia mangostana is from the genus Garcinia that consists of over 200 species. 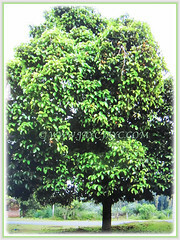 A slow-growing tropical tree that reaches between 6-25 m tall with dark brown or nearly black and flaky outer bark. It contains a gummy, slightly bitter yellow latex and a purple, staining juice inside the bark. It is upright in habitat with a pyramidal crown. The tree will be covered with large evergreen, glossy, leathery and petiolate leaves that are ovate-oblong or elliptic with smooth margins. Its leaves, 9-25 cm long and 4.5-10 cm wide with conspicuous and pale midrib are dark green on the top surface and yellow-green underneath. Leaves are oppositely arranged along the stems. The 3.8-5 cm wide flowers may be male or hermaphrodite on the same tree. 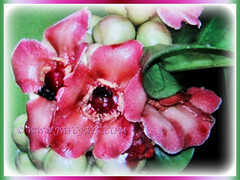 Male flowers are borne in cluster of 3-9 at the branch tips, fleshy and green with red spots on the outside and yellowish-red inside. On the other hand, hermaphrodite flowers are borne singly or in pairs at the tips of young branchlets and petals are yellowish-green bordered with red and are short-lived. The fruit, measuring 3.4-7.5 cm in diameter is round and covered by an inedible, dark purple to reddish-purple rind when ripe. The fibrous red rind, 6-10 mm thick protects the 4-8 triangular snow-white segments of ambrosial flesh that are arranged like a peeled mandarin orange. Its flesh is juicy and sweet with a slightly acidic taste. The number of fleshy segments is proportional to the number of brown to grey, triangular lobes at the bottom of the fruit. In each fruit, the fragrant edible flesh that surrounds each seed is the endocarp. Seed is almond-shaped which is not a true seed but rather an adventitious embryo or hypocotyl tubercles. 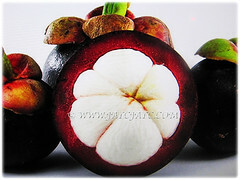 Culture (Care): Garcinia mangostana or Mangosteen can be grown easily with least maintenance. Moisture: Moderate water requirements. It benefits in a high humid environment. Others: Mulch around the tree of the mangosteen once it becomes established as it will help retain moisture and control weeds. This beauty much be sheltered from strong winds and salt spray. Prune the tree to maintain a low height for easy harvesting. Once every three months, feed the tree with a 16-16-16 fertiliser to stimulate growth and fruit production. Generally free from serious pests and diseases. Mangosteen trees rarely suffer from pest and are not often plagued by diseases because of the bitter latex exuded from the bark. However, it is susceptible to pathogens such as Pestalotiopsis leaf blight, stem canker, white thread blight, leaf miner and fruit borer. For subtropical and temperate regions: Hardiness: USDA Zone 11-12. 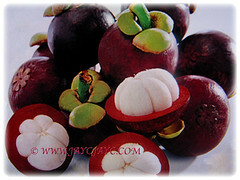 Garcinia mangostana or Mangosteen is a ultra-tropical tree that is intolerant of temperatures below 4.44°C or above 37.78°C. Exposure to temps below 0°C for prolonged period will usually kill a mature plant. The tree is known to recover from brief cold spells rather well, often with damage only to young growth. The ideal temperature range for growing and producing fruits is 25-35 °C with a relative humidity over 80%. In non-hardy regions, gardeners can grow it in a large container or tub in a greenhouse with sufficient light. Propagation: Usually propagated from fresh seeds that will germinate between 14-21 days. Vegetative propagation by selection of rootstock and grafting is difficult. Seedlings are more robust and reach fruiting earlier than vegetative propagated plants. Usage: Garcinia mangostana or Mangosteen produces edible fruits that are best eaten fresh as processing tends to ruin the flavour. It is sometimes eaten with sherbert or ice cream. The fruit tends to be in season at the same time as Durian. Some Chinese like to eat the fruits together because they believe mangosteen has a cooling effect while durian has a heating effect. Besides, it is well-known for its medicinal uses. In many Asian countries, the bark and fruit skin is used to treat diarrhea and dysentery. The rind contains a high concentration of tannin and is used to treat dysentery. The Malays use a decoction of the roots to treat irregular menstruation. 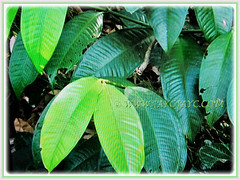 In Indonesia, the bark and leaves are considered astringent and also used to control fever. The sap of the mangosteen has been used as a black coloring agent to dye silk. Mangosteen twigs have been used as chew sticks in Ghana and the wood has been used to make spears and cabinetry in Thailand. 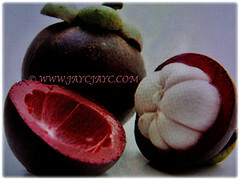 The rind of the mangosteen fruit has been used to tan leather in China. Various parts of the plant have a history of use in traditional medicine, mostly in Southeast Asia where they have been used to treat skin infections, wounds, dysentery, urinary tract infections and gastrointestinal complaints. Dried fruits are shipped to be processed for medical uses which may include dysentery, skin disorders and various other minor diseases in several countries across Asia.